We love a good Blood Mary. The drink itself, rich with tomato juice (and its accompanying jolt of Vitamin C) and brightened by spices (and by vodka, unless you like yours alcohol free), is delicious and satisfying. But it’s when we add extras—from sauces and spices to veggies to meats and cheeses—that the Bloody Mary is almost like a meal in a glass. One of the beautiful things about a Bloody Mary is its ability to appeal to just about anyone’s taste. Whether you like yours extra-hot, jam-packed with extras, or utterly unadulterated, there’s a Bloody for everyone. 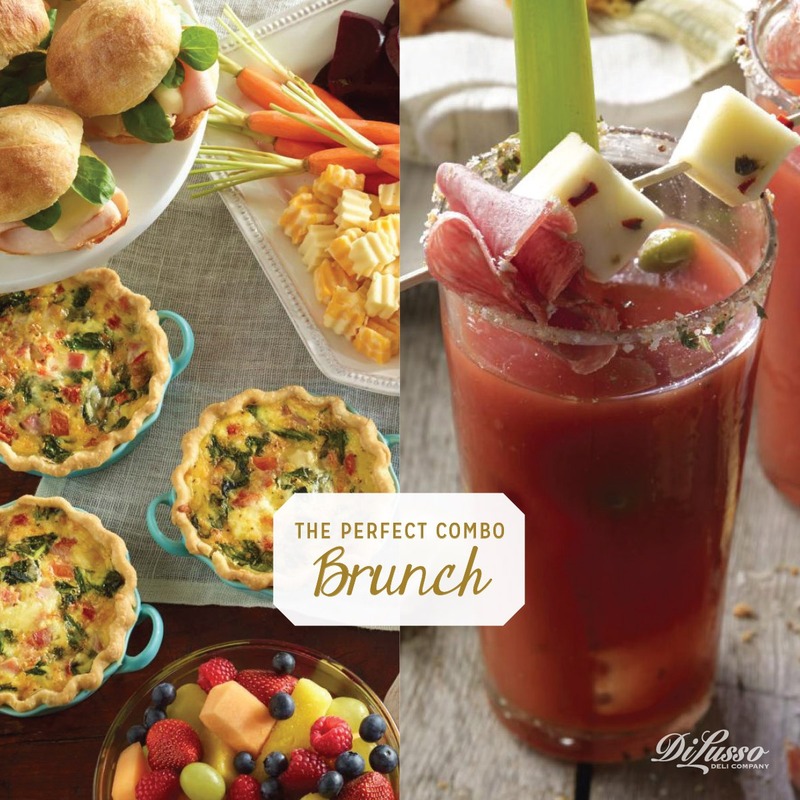 That’s why they’re so perfect when served make-your-own style: set up a Bloody Mary bar and let your guests have at it. Have glasses at the ready. Next to the glasses, place a small saucer of water for wetting the rim of the glass. Set out saucers of various rim garnishes: sea salt and garlic powder; celery salt; lemon pepper and sea salt; prepared seasoned salt, smoked paprika, etc.—as few or as many as you like. After wetting the rim of the glass, have guests dip into the rim garnish of their choice. The water will help it stick. Next in the assembly line: ample ice cubes, and an ice-cube tongs. Vodka is next. Have a shot glass or two handy for measuring. Add Bloody Mary mix (see above). Now come the garnishes. Have available your choice of add-ons including cubes of DI LUSSO® cheeses, DI LUSSO® meats such as Prosciutto, Hard Salami, Genoa, and turkey; celery; pickled veggies; olives; peppers; marinated artichokes; lemon and lime wedges—whatever you like. Make sure you have plenty of wooden picks or skewers that are long enough to accommodate as few or as many of these your guests happen to choose. Finally, let guests finish off their custom-tailored Bloody Mary with additional sauces and flavorings like sriracha, hot sauce, Worcestershire, DI LUSSO™ Horseradish, etc. Provide straws or stir-sticks for mixing. Invite guests to help themselves to any of the meat, cheese, and vegetable garnishes to eat on the side, if they prefer that to adding them to their drink, plus crusty bread slices and crackers.